What Do Blood Pressure Numbers Mean? What Is Considered Dangerous? What Are the Symptoms and Signs of High Blood Pressure? Will Diet and Exercise Treat High Blood Pressure Naturally? What MedicationsTreat High Blood Pressure? What Alternative Treatments or Dietary Supplements Lower Blood Pressure Naturally? How Often Should I See My Doctor for My High Blood Pressure? High blood pressure (hypertension) is known as the "silent killer" since it has no initial symptoms, but can lead to long-term disease and complications. Many individuals have high blood pressure, but do not know it. High blood pressure is the leading cause of death and disability in the United States. While it ranks second to tobacco use as a preventable cause of death for any reason, high blood pressure is the number one cause of preventable heart- and stroke-related death. Public awareness of these dangers has increased. High blood pressure has become the second most common reason for medical office visits in the United States. Blood pressure is measured with a blood pressure cuff and recorded as two numbers, for example, 120/80 mm Hg (millimeters of mercury). Blood pressure measurements are usually taken at the upper arm over the brachial artery. The top, larger number is called the systolic pressure. This measures the pressure generated when the heart contracts (pumps). It reflects the pressure of the blood against arterial walls. The American Heart Association and the American College of Cardiology has recommended guidelines to define normal and high blood pressure (all values are in mm Hg). Based on these new 2017 guidelines defining high blood pressure, as many as half of all Americans will have this disease (48% of men and 43% of women). Uncontrolled high blood pressure is responsible for many cases of death and disability resulting from heart attack, stroke, and kidney failure. According to research studies, the risk of dying of a heart attack is directly linked to high blood pressure, particularly systolic hypertension. The higher your blood pressure, the higher the risk. Maintaining lifelong control of hypertension decreases the future risk of complications such as heart attack and stroke. Sometimes people with markedly elevated blood pressure may develop complications because organs are stressed when they are exposed to the elevated pressures. People often do not seek medical care until they have symptoms arising from the organ damage caused by chronic (ongoing, long-term) high blood pressure. These types of organ damage are commonly seen in chronic high blood pressure. About 1% of people with high blood pressure do not seek medical care until the high blood pressure is very severe, a condition known as malignant hypertension or a hypertensive emergency. In malignant hypertension, the diastolic blood pressure (the lower number) often exceeds 120 mm Hg. In 90% of individuals with hypertension, the cause of high blood pressure is not known and is referred to as primary or essential hypertension. While the specific cause is unknown, there are risk factors that can contribute to developing high blood pressure. Age: The older a person is, the greater the likelihood that he or she will develop high blood pressure, especially elevated systolic readings. This is largely due to arteriosclerosis, or "hardening of the arteries." Race: African Americans develop high blood pressure more often than Caucasians. They develop high blood pressure at a younger age and develop more severe complications sooner in life. Age and Race: For adults who are older than 45 years old and do not have high blood pressure, the risk of developing the disease later in life is 93%for African-Americans, 92% for Hispanics, 86% for Caucasians, and 84% for Chinese. Socioeconomic status: High blood pressure is found more commonly among the less educated and lower socioeconomic groups. Residents of the southeastern United States, both Caucasian and African American, are more likely to have high blood pressure than residents of other regions. Pre-eclampsia (high blood pressure during pregnancy that occurs after the 20th week and may be associated with protein in the urine. Many symptoms present gradually after years of poorly blood pressure control. Often, the first knowledge of hypertension occurs when a patient complains of chest pain or has stroke-like symptoms. Should these occur, it is appropriate to call 911 immediately (if available) to activate emergency medical services and seek care. There are non-specific symptoms associated with hypertension that may cause a person to seek care, including lightheadedness, dizziness, headache with or without nausea, change in vision, or lethargy and fatigue. There are many other reasons to develop these symptoms other than high blood pressure. The American Heart Association and the American College of Cardiology recommend specific steps to measure blood pressure in a medical setting. Eye examination with an ophthalmoscope may be helpful by looking at the small blood vessels on the retina in the back of the eyeball. Electrocardiogram (ECG) may help evaluate heart rate and rhythm. It is a screening test to help assess heart muscle thickness. If hypertension is long-standing, the heart muscle has to hypertrophy, or get larger, to push blood against the increased pressure within the arteries of the body. Doppler ultrasound is used to check blood flow through arteries at pulse points in your arms, legs, hands, and feet. This is an accurate way to detect peripheral vascular disease, which can be associated with high blood pressure. Abdominal ultrasound is able to evaluate organs in the abdomen as well as blood flow in major arteries including the aorta, the renal arteries to the kidneys, and the mesenteric arteries to the stomach and intestine. There also is a stepwise approach to treating high blood pressure, and it combines the stage of hypertension with the calculated risk of future atherosclerotic cardiovascular disease (ASCVD, heart attack or stroke). There are online calculators that are available from the American Heart Association. If the person has normal blood pressure, the recommendation is to promote positive lifestyle habits and have blood pressure readings checked every year. If there is elevated blood pressure, lifestyle modifications should be attempted and blood pressure should be rechecked in 3-6 months. In stage 1 hypertension, if the risk of ASCVD is less than 10%, lifestyle modification is recommended with recheck in 1-6 months. In stage 1 hypertension with ASCVD risk greater than 10%, medications should be added to lifestyle modification with reassessment in 1 month. If normal blood pressure goals are not met, additional medications may be added. With Stage 2 hypertension, medications and lifestyle modification should begin immediately, with recheck in 1 month and adding additional medications if goals are not met. In about half of people with high blood pressure, limiting sodium intake by eliminating table salt, cooking salt, and salty and processed foods can reduce blood pressure by 5 mm Hg. Losing weight and participating in regular physical activity can reduce blood pressure further. If these lifestyle changes and choices don't work, medications should be added. The medications have been proven to reduce the risk of stroke, heart disease, and kidney problems. Aim for a healthy weight range for your height and body type. Your health care practitioner can help you calculate a healthy target weight. Even a small amount of weight loss can make a major difference in lowering or preventing high blood pressure. You must burn more calories than you take in to lose weight. Some weight loss medications also carry major risks and may even elevate blood pressure, and great caution is advised in using these drugs. Please ask your health care practitioner or pharmacist for help in deciding if a weight loss medication is appropriate for your situation. Physical activity reduces total cholesterol and bad cholesterol (low density lipoprotein or LDL) and raises the good cholesterol (high density lipoprotein or HDL). Both the American Heart Association (AHA) and the U.S. Surgeon General recommend 30 minutes of physical activity on most days of the week. Physical activity includes many daily activities such as cleaning the house, raking the lawn, and walking. Other possible sources of activity can include using the stairs instead of an elevator or escalator, walking for errands instead of driving a car, and participating in a sport or social activity such dancing. The decision as to which medication to use depends upon the patient’s situation and underlying medical conditions. Individuals with diabetes, kidney disease, pregnancy, and other secondary causes of hypertension may have specific medication needs. Diuretics are used very widely to control mildly high blood pressure, and are often used in combination with other medications. They increase sodium excretion and urine output and decrease blood volume. The sensitivity to the effect of other hormones in your body is decreased. Of appropriate, chlorthalidone is the preferred diuretic. Beta-blockers reduce heart rate and decrease the force of heart contraction by blocking the action of adrenaline receptors. Beta blockers are widely prescribed and effective but can cause increased fatigue and decreased exercise tolerance because they prevent an increased heart rate as a normal response to physical activity. They are also prescribed for people who have associated heart disease, angina, or history of a heart attack. Calcium channel blocking agents work by relaxing the muscle in artery walls and by therefore reducing the force of contraction of heart muscle. ACE inhibitors stop the production in the body of a chemical called angiotensin II, which causes blood vessels to contract. Narrower blood vessels are associated with increased blood pressure. Relaxing artery walls leads to lower blood pressure. ARBs work block angiotensin II receptors and prevent vasoconstriction, or narrowing of blood vessels. These agents block messages from the brain's autonomic nervous system that contract blood vessels. The autonomic nervous system is the part of the unconscious nervous system of the body that controls heart rate, breathing rate, and other basic functions. 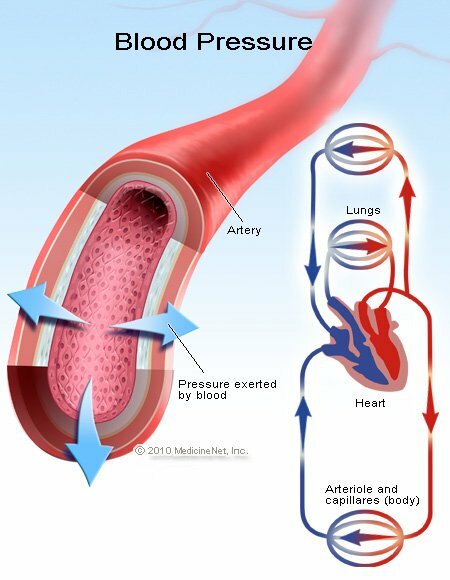 Direct vasodilators relax (dilate) the blood vessels to allow blood to flow under lower pressure. These medications are most often used in times of hypertensive emergency and are injected intravenously to quickly lower blood pressure readings. Examples include nitroprusside (Nitropress), and diazoxide (Hyperstat). Take your high blood pressure medicine as prescribed and only discontinue them on the advise of your doctor or other healthcare professional. Acupuncture and biofeedback are well-accepted alternative techniques that may help some people with high blood pressure. Techniques that induce relaxation and reduce stress are recommended. These include meditation, yoga, and relaxation training. These techniques alone may not control high blood pressure for many people. They should not be used as a substitute for medical therapy without first consulting with your health care practitioner. Examples include vitamins, garlic, fish oil, L-arginine, soy, coenzyme Q10, herbs, phytosterols, and chelation therapy. While these substances may be beneficial, the exact nature of their benefits is not known. Scientific studies have produced no evidence that these therapies lower blood pressure or prevent the complications of high blood pressure. Most of these substances are harmless if taken in moderate doses. Most people can take them without problems. Talk to your health care practitioner if you are considering any of these treatments. Substituting these therapies for medical therapies that have been shown to lower blood pressure and the risk of complications may have a harmful effect on your health. The most important element in the management of high blood pressure is follow-up care. Routine blood pressure check-ups are important to monitor readings and decide upon a treatment plan. With age and the natural progression of hardening of the arteries, systolic blood pressure may elevate over time. A treatment that once worked well may no longer work as well and your medication treatment may need to be changed. Routine physical exams and screening blood tests may be suggested to help monitor the success of blood pressure management. Follow-up visits are a good time to discuss with your doctor any medication side effects that you may be experiencing. Your doctor will have suggestions for managing side effects or may change your treatment. Follow-up visits are a great opportunity for monitoring for other associated risk factors, such as high cholesterol, smoking cessation, and obesity. Eat a nutritious, low-fat diet. The National Heart, Lung and Blood Institute of the NIH outlines the DASH diet, that is describes as a "flexible and balanced eating plan that helps create a heart-healthy eating style for life." Decrease salt (sodium) intake, read food labels so you know the salt content before you buy a product in the grocery store or eating a meal at a fast food restaurant, and avoid adding salt to foods. Maintain a healthy weight, and if you are overweight or obese, try to lose weight. Get routine health assessments and blood pressure screening. Take your blood pressure medications as directed, even if you're feeling fine. Reduce stress and practice relaxation techniques, for example, meditation, Yoga, Tai Chi, and other types of physical activity. Untreated or poorly controlled high blood pressure is a major risk factor for heart attack, stroke, and kidney failure. That is why high blood pressure is called "the silent killer." High blood pressure or hypertension is a very common condition. About half of all Americans have the high blood pressure, moreover, many do no know it. Hypertension often is called the silent killer because few signs or symptoms occur. When symptoms do occur, they include severe headaches, chest pain, vision problems, and fatigue. Czupryniak L, et al. Circadian blood pressure variation in morbidly obese hypertensive patients undergoing gastric bypass surgery; Am J Hypertens. 2005 Apr;18(4 Pt 1):446-51. Dyer KL, et al. Use of myocardial performance index in pediatric patients with idiopathic pulmonary arterial hypertension; J Am Soc Echocardiogr. 2006 Jan;19(1):21-7. Hoeper MM, et al. Goal-oriented treatment and combination therapy for pulmonary arterial hypertension; Eur Respir J. 2005 Nov;26(5):858-63. Lipsitz LA, et al. Antihypertensive therapy increases cerebral blood flow and carotid distensibility in hypertensive elderly subjects; Hypertension. 2005 Feb;45(2):216-21. Epub 2005 Jan 17. Pischke CR, et al. Comparison of coronary risk factors and quality of life in coronary artery disease patients with versus without diabetes mellitus; Am J Cardiol; 2006 May 1;97(9):1267-73. Epub 2006 Mar 10. Whelton PK, et al. 2017 High Blood Pressure Clinical Practice Guideline: Executive Summary. 2017 ACC/AHA/AAPA/ABC/ACPM/AGS/APhA/ASH/ASPC/NMA/PCNA Guideline for the Prevention, Detection, Evaluation, and Management of High Blood Pressure in Adults. Nov 2017. NIH. Description of the DASH Eating Plan. Updated: Sep 16, 2015. David Baldwin, MA, DM FRCPsych. Generalized anxiety disorder in adults: Epidemiology, pathogenesis, clinical manifestations, course, assessment, and diagnosis. 3 April 2018. 14 November 2018 . Denise Griswold, MSc, LCAS. How Anxiety Affects Blood Pressure. 27 October 2018. 14 November 2018 . How was your high blood pressure diagnosed? Please share medications for your high blood pressure? Please describe your experience with high blood pressure.